5.0 颗星，最多 5 颗星Please reprint! I don't want to ding this book on the content, the previous editions were great, but like another reviewer, the book literally cracked in half and pages started falling out the first time I (gently) opened it. Here is hoping that the publisher addresses the issue, or perhaps this is part of a bad run -- but it is pretty amazing that Wiley let these out the door. Want to know how to make great software products and systems? Buy this book, read it, and share with your team. There's really nothing like it. 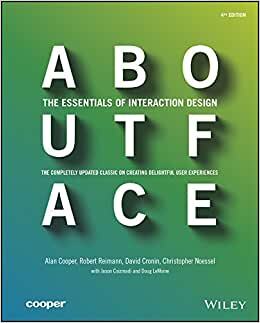 This is the fourth version of a 1995 book by Alan Cooper that helped launch the interaction design discipline. Written for practitioners and cited by researchers, each edition of About Face has advanced the field. And this thoroughly updated edition will do the same. Sure, you can read blogs on the web that have interesting tidbits to say about designing for social, the niceties of interactive data displays, or gesture design for mobile. And you can certainly buy books that offer design lessons and principles. But no other resource has tackled the subject at the methodical depth and breadth that Cooper's team of writers do here. The material is useful for newbie designers (worth the price just for the consistent and battle-tested vocabulary). What's more, the book provides philosophies, methods, and resources that experienced design managers can use to build happy design teams that programmers and executives love to work with. The writing is often playful, the design is elegant, and the ideas are incendiary. Enjoy! 3.0 颗星，最多 5 颗星Great content, horrible binding - it's falling apart. Great content for those who like process. Horrible binding. My return window has closed, but I am going to shake the tree on this one. Only a few months old, have only read about half of it and it's literally falling apart. Shameful. 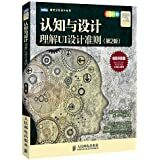 5.0 颗星，最多 5 颗星Pages are falling out! I love the material in the book but the pages are falling out. I'm holding the book together with binder clips. I've only read up through chapter 4 and there are 21 chapters. They don't make binder clips big enough! Am I going to need to glue it? Great book for anyone interested in learning about product design/research. Touches upon the most important and fundamental topics in understanding users and designing products that are user-centered. I read this book quite often just to keep my basics strong.